A python hunter captured an almost 17-foot long snake using just his bare hands. Dusty ‘The Wildman’ Crum managed to wrestle the creature while traipsing through the Florida Everglades. It’s the biggest python that’s ever been caught in the national park. Later, it was discovered that the snake had 78 eggs inside – which were taken out to prevent any new snakes from being born. 78 eggs.... That dude must have had one hell of an omelette for supper that night! ty for sharing brother.what gets me the most is they won't put a all yr long hunt for those snakes and hogs that r destroy ing land and those snakes r eating everything in sight. About three months after mating, a Burmese Python is ready to lay its eggs. It can lay up to 100 eggs at a time, and once it does this, it pushes them all together and coils around them. For the entire time the babies are in the eggs, the mother stays coiled around them. She does not leave to do anything - not even to eat. She keeps them warm by vibrating her muscles and protects them from predators. The mother stays with them for about six to eight weeks, and at that time, the eggs are ready to hatch. The baby pythons hatch to be about 20 inches long and can weigh up to 5 ounces. After they have hatched, the mother leaves them on their own. They must fend for themselves and find their own food to survive. The snakes then grow up to between 15 to 25 years of age. Once they reach adulthood, the females and males mate, and the life cycle begins at the beginning again. Burmese pythons reach sexual maturity in four to five years. Males breed at 7 to 9 feet and females breed when they are at least 9 feet. When ready to mate, the female pythons release Pheromones, chemicals that are secreted to send messages to other animals, which notify male Pythons in the area that there is a female that is ready to mate. After mating, the female may lay up to 100 eggs, but the average amount of eggs they lay is about 35. Unlike most snakes, the female coils around the clutch until the eggs hatch, keeping them warm. This is accomplished by hiccuping or muscle spasms which increases the temperature by as much as seven degrees. The mother also stays with the eggs to protect them from predators. During this entire time, the mother does not leave the eggs, not even to eat. Once the babies hatch, the mother leaves them on their own. They must find their own food and shelter, and must protect themselves from predators. I wonder how many wallets and boots a 17' Python will yield? "Leave a legacy...Preserve the irreplaceable"
Only wrestling going on would be me going for a Sig 40. Florida Lt. Gov. 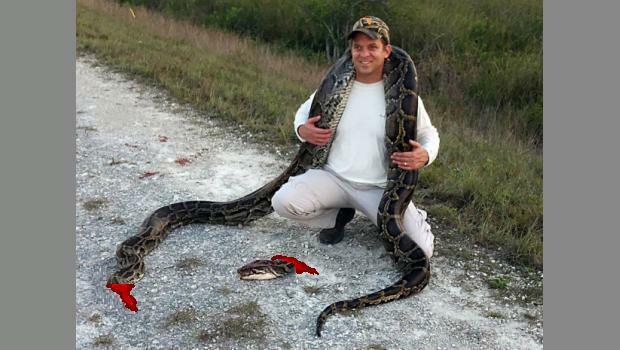 Carlos Lopez Cantera poses with a 15-foot-4 inch python caught Monday in the Everglades in Florida. Cantera went python hunting with the district hunters. As if Tree Huggers and Kryakers weren't enough, now we're gonna have Snake Huggers ? ..
Oh yea, couldn't have done that . . .
it may have offended some of the other snake huggers.